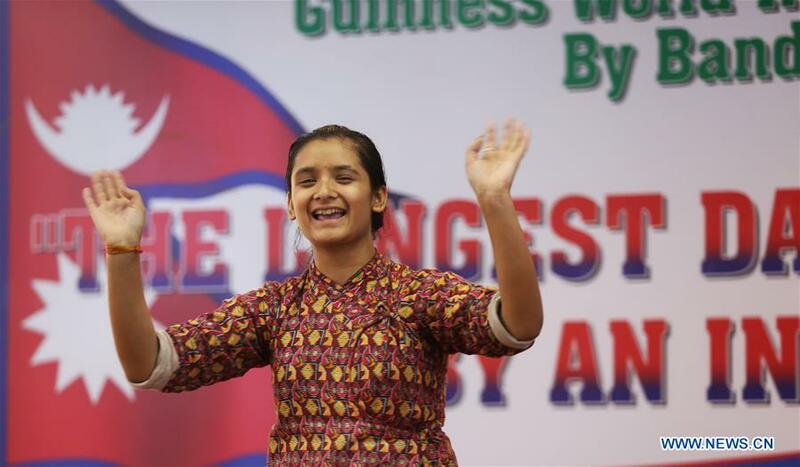 KATHMANDU, Nov. 28 (Xinhua) -- A 17-year-old Nepali girl Bandana Nepal danced for 126 consecutive hours to set the Guinness World Records on "Longest Dancing Marathon by an Individual". Bandana Nepal started the solo dance from Nov. 23 (Friday) and continued it till Wednesday afternoon (Nov. 28) to contest for the record, according to the event management officials. She performed in Nepali music in the hall of Big Foodland restaurant located in Kathmandu amid the presence of witnesses, including family members, media and general public. With the dance for 126 hours, she has been able to break the record of Kalamandalam Hemlatha from India who danced for 123 hours and 15 minutes in 2011. Despite of continuously shaking her hips and wiggling her neck for 6 days without sleep, rest and proper food, the young girl managed to dance till the targeted hour by maintaining smile on her face. Though she could not be reached for immediate interview owing to her non-stop physical labor and mental restlessness, she exchanged smiles with media and the audiences. Ram Nepal, the father of Bandana Nepal, told Xinhua on the spot "I am very glad to see my daughter being able to keep the world record. This achievement is not just of hers, but she has also set the nation's name at the global front. It's a moment of pride for all of us. " He further shared that through the world record, Bandana thrives to inspire other women, girls and Nepalese citizens for dreaming big and achieving. The teenager, who hails from eastern district Dhankuta, started dancing at the age of five and has been trained in both Nepal and India. Her family members said that she used to dance with her younger brother at home. As part of the preparation of record setting performance, she had danced for around 100 hours. Bandana is currently studying Business Management in Grade 12 in Kathmandu. During the entire performance, Bandana was supported by her friends and family, who danced along with her and motivated her to achieve the target. In the short breaks, she was provided with energy drink, milk and high-nutrient food. Ram Nepal, her Uncle, who is also the event coordinator, told media that she danced only in Nepali songs, which helps promote Nepali culture globally. "In our generation, it was difficult for women to even dance or smile publicly, but now time has changed. I feel so proud of my granddaughter that she has been able to keep her name globally," Bandana's 63-year-old grandmother shared her happiness with Xinhua. The event management team said that they were already in process of submitting the evidences to Guinness World Records to get the certificate, which might take some one month time or more.